"In case you haven't noticed, there's an unidentified freaky object in here!" 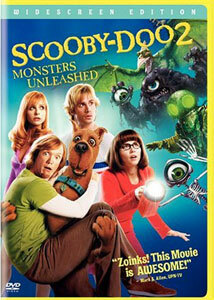 The Scooby-Doo movie franchise, represented here by the second film in the series, is one of those polarizing entities. Not of the volatile "should Greedo shoot first?" variety, but more of a looser "did they really need to make this?" kind. The naysayers/purists condemn the overuse of CG effects and the general bastardizing of a childhood television icon, while the other camp slips in with relatively low expectations and walk away with a few laughs. but nothing in the way of stick-to-your-ribs substance. I really had great apprehension about the first Scooby-Doo�despite the presence of Sarah Michelle Gellar—but the self-mockery and exuberant special effects somehow won me over, and though it was a brainless piece of summertime fluff, I had to remind myself that it was based on an even more brainless bit of animated fluff. Yes, I liked the first one. So sue me. The original cast returns for Scooby-Doo 2: Monsters Unleashed—once again directed by Raja Gosnell—with the Mystery Inc team made up of Fred (Freddie Prinze Jr), Daphne (Sarah Michelle Gellar), Velma (Linda Cardellini), Shaggy (Matthew Lillard) and Scooby-Doo (voiced by Neil Fanning), here working to solve yet another mystery. This time their case involves a spooky masked figure who is bringing to life the former villains from Mystery Inc.'s past, and the gang has the added pressure of dealing with a rash of negative press as the public turns against them. In between the monster hunting, Velma dabbles awkwardly in romance with a nerdy Coolsville museum curator (Seth Green), Freddie and Daphne get verbally trashed by an unscrupulous reporter (Alicia Silverstone) and Shaggy and Scooby try to prove themselves worthy of being "mondo groovy detectives" by getting the goods on prime suspect Old Man Wickles (Peter Boyle). The screenplay still layers on the same kind of humor and self-mockery found in the first film�at one point Shaggy utters "They're having a montage in there without us"—and Gosnell seems to get the joke that he's not reworking Shakespeare here. There's no need for logic (the talking dog negates that), problem resolution has the same goofy simplicity found in the original cartoons, but by poking fun at the entire premise a film like Scooby-Doo 2: Monsters Unleashed gives a nudge and wink to fans; this isn't supposed to be taken seriously. We get fart jokes, kicked-in-the-crotch jokes, Fred and his ascot jokes, Velma decked out like Elizabeth Hurley in a red leather jumpsuit, all sprinkled amidst some noisy and frenetic CG action set pieces that do a fine job capturing a genuine comic book vibe, even far more excessively and stylishly than the first film did. One can always argue that Linda Cardellini is too attractive to be frumpy Velma, or that Sarah Michelle Gellar's Buffy-esque fight moves seem a tad uncharacteristic for fashion-conscious Daphne. That all gets overshadowed by Matthew Lillard's complete and total channeling of Shaggy, and as he did in the first Scooby-Doo, not only delivers probably the most accurate animation-to-live-action transition in recent memory, but does 90% of scenes with a CG dog. While the other main characters more or less look the part (though Cardellini IS too hot for Velma), Lillard is Shaggy. It's alright to like this stuff. Really, it is. Image Transfer Review: Scooby-Doo 2: Monsters Unleashed has been issued in an outstanding 1.85:1 anamorphic widescreen transfer, though if you hate those black bars you can always opt for the separate full-frame DVD. The choice is yours. But let's talk this widescreen disc, which is really just an all-around gorgeous looking print, oozing with bright, vivid colors, and spot-on black levels. Not a trace of any pesky compression issues or artifacting. This is really one of the strongest transfers I've seen in quite some time. Beautiful. Audio Transfer Review: A film like this is big and noisy, and the 5.1 Dolby Digital surround track delivers plenty of booming bass and active rear channels, and if it weren't for the fact that dialogue often ended up buried in the mix, this would be just about perfect. As it is, the noisier sequences often overshadow the dialogue (not that it's much more than one-liners), and while the surround effects are nicely done, the clarity of the overall mix reveals a few minor flaws. French and Spanish 5.1 tracks are also included. Extras Review: Most of the extras found here are kid-related, with the possible exception of the seven Deleted Scenes (07m:15s), available with or without a commentary track from director Raja Gosnell. The scenes are mostly things cut for pacing and the like, and largely feature unfinished Scooby animation, or in one case missing entirely. Scooby-Doo's Triple Threat Feature (10m:15s) is a silly and light EPK piece, hosted by Scooby-Doo, offering the usual brief behind-the-scenes snippets, but not much of substance. Dancing Dog (05m:30s) not only offers a quick tutorial on how to replicate the moves that Scooby busts on the dance floor, but also shows a couple of effects tricks done to combine CG and live-action. True Ghoul Hollywood Stories (05m:45s) is the cleverest of the extras, offering a clever mockumentary profiling the supposedly real-life Cotton Candy Glob, Redbeard's Ghost and Ozark Witch villains, using a blend of interviews and "re-enactments." Cute stuff. A couple of remote-heavy puzzlesh—The Scooby-Doo Monsters Unleashed Challenge Game and Behind The Mystery: The Mystery of the Missing Pants—are available for those so inclined to sit through setups that go on far too long. The dreaded Interactual software shows up if you pop the disc in your DVD-ROM, offering a glossy interface that leads to a handful of shameless self-promotion links. A few trailers and two music videos are also included, one for a cover of Thank You Falletin Me Be Mice Elf Again by Big Brovaz, and the other is Don't Wanna Think About You by cheery Blink 182-lite Canadian popsters Simple Plan. The disc is cut into 25 chapters, and features optional subtitles in English, French or Spanish. The gang returns to battle a whole slew of monsters, and the in-jokes are stacked atop fairly active and visually stylish action sequences, which makes this sequel actually more enjoyable than the first one. Well, except maybe for that unnecessary cameo by Ruben Studdard. Do I lose street cred by recommending this? Who cares?